Tina Edwards selects the nine artists you’ll be listening to in 2019. For someone who writes about music; turns on the radio first thing in the morning, scours Bandcamp throughout the day, and sees more gigs in the week than hot dinners, January is a buzzy time. The hype machine goes – understandably – red hot, as do the earlobes of artists who are being talked about and pitched for big things in the year ahead. In the last few years, it’s been exciting to watch spotlighted artists rise; names like Joe Armon-Jones, Poppy Ajudha, Braxton Cook and Ben Lamar Gay to name a few. I remember sitting on my bedroom floor in January 2016, listening to this guy called Anderson .Paak, and wondering how much longer it would be until he’s celebrated as a global star. For me, forecasting who is about to present something crucial and forward-facing is one of the most exciting things about new music; after all, music is a reflection of ourselves, social and political terrain, and how we plan to navigate the world around us. Here are the names who are going to show us our reflections in 2019. Like a meteor, West London artist Lava La Rue picked up serious momentum towards the end of 2018. At the start of the year, she could be found dominating tiny stages in front of 50 people. With her Colors session, own fashion line and continuing expansion of her musical network NINE8 Collective – who’ve just started releasing their own music – Lava La Rue’s platform has grown fast; she found herself on a Christine and the Queens tour by the end of the year. Her voice dulcet, her words eye-opening, Lava La Rue trailblazes into 2019 with a totally rejuvinated take on the West London sound, also drawing on what it is to be young, black and queer. Check out ‘Letra EP’ and await another release this year which is certain to be heavily spotlighted. Guitarist Shirley Tetteh wet our appetites late in 2018 with her single ‘Speedial’, a hooky indie-electronic patter with soft layered harmonies and reverb claps. It’s smart-kitchness would sit pearly in a playlist alongside leftfield jazz-pop revellers such as Thundercat, Louis Cole and even Tom Tom Club. In a recent interview for The Guardian, Tetteh shared that she “left the church and accepted I was gay”, which in some part, lead her to find an exciting route to expressing herself creatively. Having grabbed our attention since then with her humble groove-laden solos as part of Nerija, 2019 will be her time to take centre-stage. Expect her debut record to drop on Lucky Number Music later this year. Following her alluring Boiler Room session, London vocalist Ego Ella May has revealed that she’s signed to mini powerhouse label, Tru Thoughts. Neo-soul and jazz-tinged, her take on songwriting is classic and modern; ‘Table For One’ is a defiant declaration of single pride. May carries a distinctive and charismatic presence that illuminates her on stage. With a fresh release on the way via the Brighton label, 14 February at Ghost Notes feels like a pretty perfect time to see her live, single or not. Pianist Sarah Tandy is yet to release any music but has already supported Robert Glasper and the late great Roy Hargrove. She’s a virtuosic player; watching her fingers move with such speed and precision is pretty hypnotic. Her debut first album, ‘Infection in the Sentence’ drops on Jazz re:freshed this March. 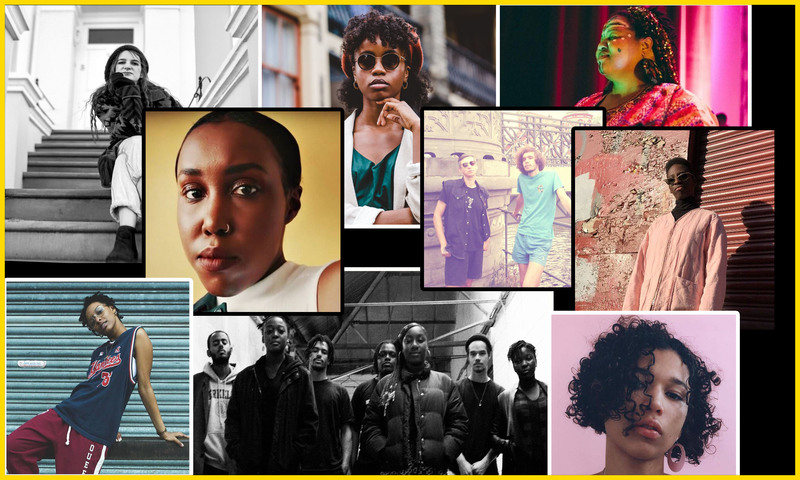 London has been presenting a lot of impressive jazz debuts in a short time, and here will be another to add to the growing list. Chicago’s jazz scene has warranted frequent periods of celebration for its progressive, avant-garde and experimental fearlessness. The city’s musicians are currently spearheaded by a strong will to elevate the South Side’s history and black expressionionism, and that message is incredibly clear in the musical presense of clarinetist, composer and vocalist Angel Bat Dawid. Relatively unknown until a few years ago, even locally, Dawid has quickly become an in-demand collaborator, recognised for her independently-spearheaded adventures, namely with a production she wrote, composed and performed in 2018, Song of Solomon: A Cosmic Love Opera. Some will have also seen her perform in an impromtu apperance with Ben Lamar Gay and Jaimie Branch at CHICAGOxLONDON. To launch her 2019, she’s announced an eight track release via International Anthem called ‘Oracle’. Angel is a spiritual artist with an aura. With fans including Emanative and Anchorsong, polish duo Gaijin Blues have gained an incredibly promising launchpad on which to reveal their self-titled debut EP. United by a fascination with Japanese music after record-digging across the region, producers Naphta and PlayStation Yoga Music have come together for what will hopefully be a continuing project. Samples from Eastern records flutter throughout the 4 track release, quilted together with Western sentiments and live studio instruments. These tunes are made for dancefloors as much as they are for stationary daydreams. Look out for the debut release being lovingly delivered by boutique South London label Shapes of Rhythm. This Mancunian rapper and vocalist bubbled her way through 2018, gaining well deserved attention after her ‘Colour Reaction’ album. Despite having a couple of releases under her belt, it’s clear that Layfullstop is still on her way to something. A feature on Children of Zeus track ‘Fear of a Flat Planet’ showed us the diversity of her soul-leaning edge. Her self-aware and socially conscious lyrics on 2018’s ‘Colour Reaction’ demonstrate her switched-on observations, delivered with melodic spoken-word. Tunes like ‘Bohemian Queen’ show us that LayfullStop has the talent to make a hook with substance. Simply put, she has the potential to be one of the UK’s most exciting rap success stories in 2019. What excites us most about Cherise Adams-Burnett is clear; her incredible voice. If you follow emerging music closely, you might recognise her as the front woman of progressive London band Trope or perhaps for her features on Ashley Henry’s Sony debut (check out her vocals on ‘Pressure’) and Camilla George track ‘Tappin the Land Turtle’. In 2018, Adam-Burnett was invited to fly to Washington DC to take part in the Betty Carter Jazz Ahead programme at the Kennedy Centre. A debut album will be out in 2019 with Adam-Burnett’s name on it, and we imagine it will take us to a nostalgic jazz state of mind, whilst still straddling the contemporary. This will be a debut for an artist with a long Jazz career ahead of her. ‘Nothin’ bad gonna happen while this music play’ says one of the 2000 comments underneath the Youtube video for ‘Abusey Junction’, the runaway success single that brought the ‘We Out Here’ compilation to a blissful close. With a performance at Gilles Peterson’s Worldwide Awards this month and their debut EP being released on Brownswood later this year, all eyes will very much be on KOKOROKO. This Afrobeat collective, fronted by trumpeter Sheila Maurice-Grey, have transcended musical tastes and habits to create one of the most celebrated Jazz tracks of the decade. Pretty incredible, given this was their only public track until January 2019. Expect the EP to land with heavy impact. Much like Nerija with its members’ individual projects (Nubya Garcia, Nardeydey, SEED Ensemble, to name a few), we wonder what seismic effect this could have on the journeys of the band’s individual players. Which rising artists are you watching in 2019? Tweet @_SupStandards.